When my beloved wife Mrs Rosemary Anne Jeffery passed away on the 3rd of June 2015 I turned again for a memorial stone purpose to the memorial stone centre ltd who had served us so efficiently in providing a headstone for our sons grave after his tragic death on the 25th august 2002. As on that occasion our wishes were most professionally and accurately interpreted by Mr Matthews who showed such patience and sensitivity and insuring that our every consideration was met. As explained to us the short comings of the traditional fixing method being used we decided to purchase the stone safe stability system for our sons grave in august of 2002 and I have no hesitation in selecting the stone safe fixing system for my wife’s grave as my late sons memorial stone has remained upright and stable, unlike others that I have seen, either layed down by the local burial authority as they have become a danger. I have also noticed that a vast amount of memorial headstone don’t remain vertical even after a short time of installation. I’m am very grateful for the services carried out and would have no hesitation in recommending the stone safe stability system. I have known Anton Matthews for around 20 years. I have marvelled at his innovative style and I was pleased to be invited when he received his richly deserved “Award for Innovation” for his outstanding Memorial Headstone Stability system at Arun District Council’s Business Partnership Dinner. I am now retired, after 50 years as a Funeral Director and Monumental Mason both in Central London and locally. During these many years the Funeral Industry has been plagued with the phenomenon of Memorial Headstones becoming loose on their bases and in many cases becoming detached and falling. 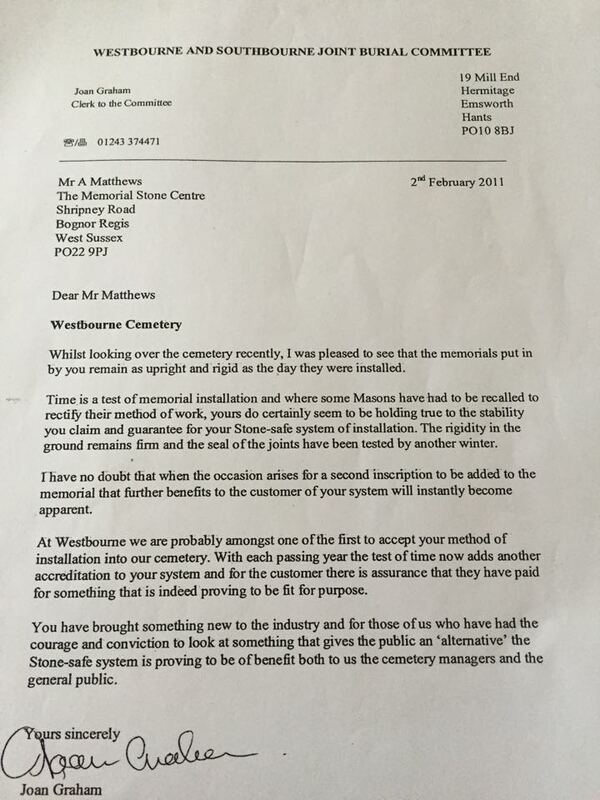 This has caused considerable stress and often cost to the families concerned and has been a source of embarrassment and additional cost to the Funeral Directors and Monumental Masons involved. In essence, the long established system of attaching headstones to their bases has been flawed. In many cases they have been attached with cement and after weathering this method has generally failed. 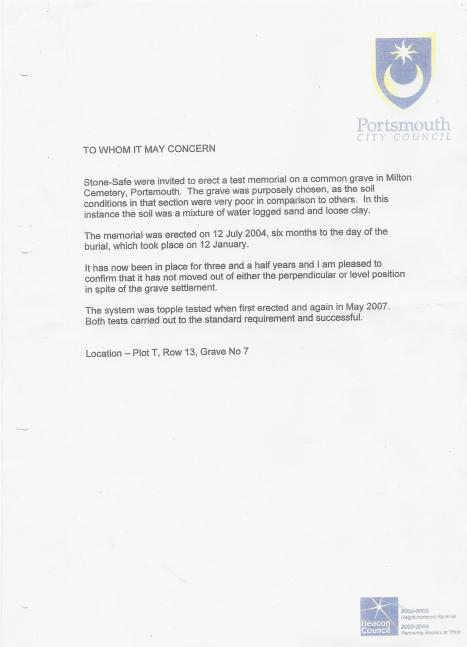 The Industry attempted to overcome this problem with the addition of a stainless steel pin set into the upright Headstone and through the base; however over time this system has also failed, with the pin gradually withdrawing from the ground. The results have in many situations been catastrophic. Clearly, a more robust solution was needed. After much research, Mr. Matthews developed his Stone Safe Stability System. I have been privileged to witness a number of rigorous and properly conducted demonstrations of this outstanding system, and I have seen how easily the pin system has totally failed in a number of circumstances and soil conditions; where the Stone Safe System, on the other hand, has well exceeded the very demanding requirements of British Standards in this respect. I know I am not alone in thoroughly endorsing The Stone Safe Stability System, and also recognising the exemplary professionalism and dedication of Mr. Anton Matthews in his contribution to the peace of mind and safety concerns of consumers. Because Anton Matthews, the proprietor of StoneSafe, was concerned about the safety of headstones being fixed using a simple stainless steel dowel driven into the ground he developed his StoneSafe headstone stability system. 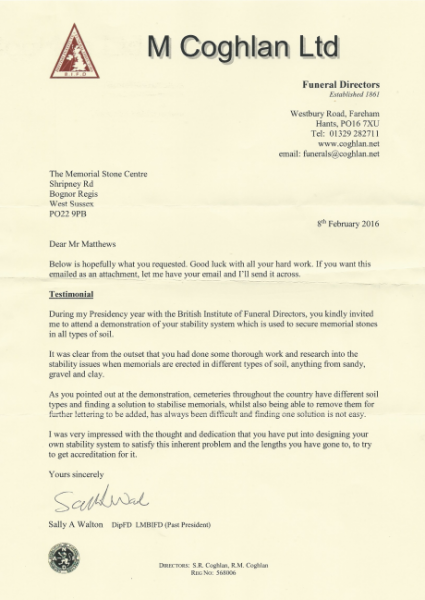 Twice I have been among the witnesses who have seen him demonstrate its ability to fulfil the requirements of British Standard 8415 (fixing of memorials) in sandy soil conditions, as required by the standard, once in a pit he had dug and filled with sand and once in undisturbed sandy soil at a cemetery in Redhill, Surrey. On both occasions the StoneSafe system was demonstrated to be able to comply with the requirements of the British Standard by withstanding a loading in excess of 150kg. I videoed the demonstrations and posted the videos on You Tube, where they remain and you can view them. 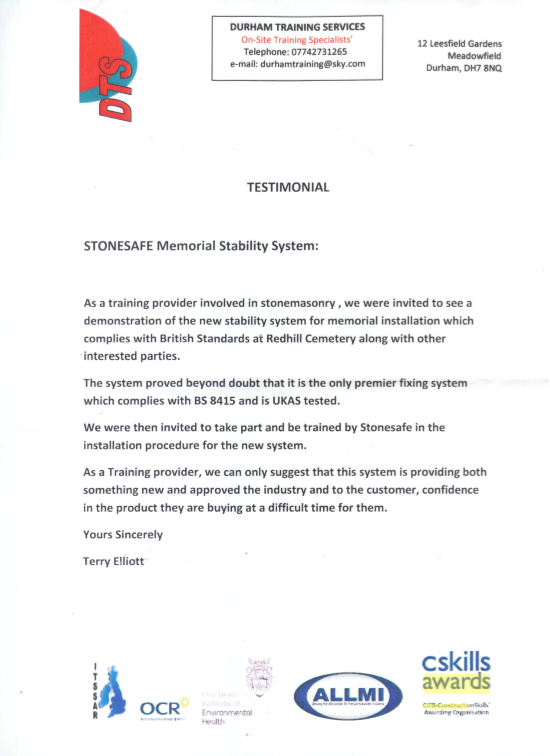 The demonstrations were impressive and I do not believe anyone can seriously doubt that the StoneSafe headstone stability system is one of the most secure ways of fixing a headstone, especially in soft soil. It is even guaranteed for 30 years. I was the cemetery manager at seven oaks (Kent) for over 10 years. I first met with Anton Matthews 6/7 years ago because I had concerns with the pin fixing method being used by memorial masons. 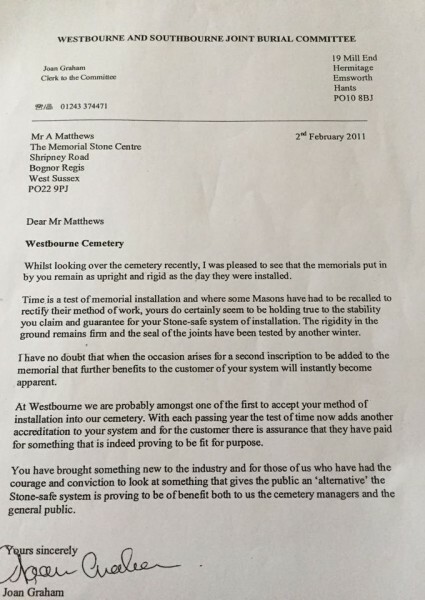 Having read an article in the ICCM (institute of crematorium and cemetery management) magazine I decided to contact Mr Matthews. After a long conversation on the telephone with him , he agreed to carry out a demonstration at the cemetery. I actually worked with him hands on to install a memorial on the stone safe stability system. I was most impressed how the system worked. A few years later I decided to start my own business, “Taylor Created Memorials” selling and installing memorials. I’m a member of both NAMM and Bramm and a NVQ installer and from my experience as a cemetery manager I saw daily the short comings of the traditional fixing method (pin). I insist that any lawn memorial I install is fitted with a stone safe stability system, for the peace of mind for the customer and for myself knowing that I have carried out a memorial installation working to best practice. The Stone-Safe Stability System has been specifically designed so that it will remain stable even in poor soil conditions! Stone-Safe installations include a 30 year insurance backed guarantee. Patent no. GB2406589 – Registered in England, Company no. 3780183.